This medal, in gold, is bestowed on State-functionaries below the rank of Counsellor of Board or College. It gives no claim to nobility or support for children. To simple citizens it is presented in silver. No 32, contains the effigy of the founder with the inscription : "Max Jos. Konig von Baiern" (Max Joseph, King of Bavaria). The reverse shows within a laurel wreath, the words : "Dem Verdienste um Fiirst und Vaterland" (For merit of Prince and country). It is worn at the button hole of the left side, suspended by a silk ribbon one inch wide composed of two white and three bright-blue narrow stripes. 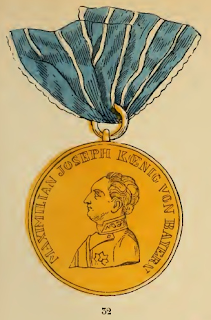 This medal supplies the place of several previous ones of a similar character, introduced by Charles Theodor (1794 and 1798), and by the Elector Max Joseph (1805) during the French war. Knightly Order exclusively for Catholics of noble descent, and imposed upon the members the duty of "defending religion and the honour of God". When Bavaria became a kingdom, and Maximilian Joseph I. began to introduce reforms in the several Orders of the state — as already seen in those of St. Hubert, St. George, and Max Joseph — he added, in the present Order, (11th September, 1808) the duty of "defending the fatherland." The statutes limited the number of the Knights of the Grand Cross to eighteen (who form the Chapter), of Officers to eight, and of Knights to thirty-six, all of whom must belong to the Catholic religion. The Grand Master was, however, free to nominate fourteen honorary members without regard to birth, rank, or religion. So it stood until the death of the Grand Master, Duke William of Bavaria in 1837. The new statutes date from the 1 6th February of that year, when the Order was erected into an Order of Merit, without distinction of birth, rank or religion, enlarging the claims thereto, to loyalty, patriotism, and distinction of useful works generally. Nobility is not ipso facto the result of the nomination. 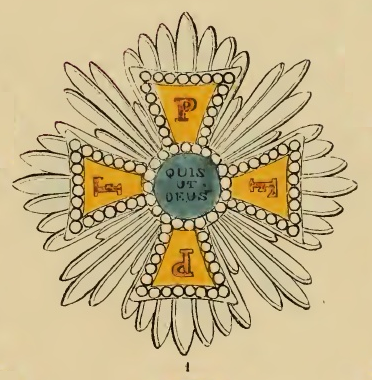 Since 1837, the number of the Grand Crosses for natives is fixed at twenty-four (exclusive of those conferred on the Knights of St. Hubert), of Commanders at forty, and of Knights at three hundred. The Order is now in so far connected with that of St. Michael, that the latter follows in rank the corresponding degree of the former. The decorations (Nos. 16 and 17) are those of the Grand Crosses and Commanders, showing on the obverse in gold-relief St. Michael in warlike attire, surrounded by flashes of lightning. His shield bears the inscription "Quis ut Deus ?" (Who is like God ?). The Cross of the (simple) Knights bears upon the face the initials of those three words. The four corners of the crosses of all classes are mounted in gold, containing in gold characters the initials : P. F. F. P. of the words "Principi Fidelis Favere Patriae" (True to the Prince and attached to the country). The Cross itself is azure blue, octagonal, and covered by a royal crown. The reverse (in all classes) contains in blue enanael the word "Virtuti" (To virtue) upon a golden ground. The Knights of the Grand Cross wear besides, upon the left breast, a golden cross upon a star of silver rays with the above motto "Quis ut Deus ?" (No. 15). Of the width of the ribbon by which the Order is suspended, two thirds are dark blue, and one third rose colour, in equal proportions for both ends. 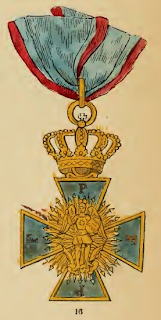 The Knights of the Grand Cross wear the Order across the right (since 1844 upon the left) shoulder, suspended by the above ribbon about three and a half inches wide ; the Commanders wear it in smaller size round the neck by a somewhat narrower ribbon, while the Knights have it, in still smaller proportions, fastened to the coat. No. 29 represents the chain which the members formerly used to wear upon their costume on festival days, while the new statutes mention neither costume nor chain. In 1846, the total number of the members was fixed at four hundred and sixteen, viz. thirty-six Grand Crosses, sixty Commanders, and three hundred and twenty Knights.